Sometimes you just want to kill a whole bunch of things at once, or to paraphrase Samuel L. Jackson in Jackie Brown, sometimes you absolutely, positively got to kill every mob in the room. Well, the automatic machine gun is the way to do it; accept no substitutes! Here's a video of it in action. There's something awesome about watching hundreds of arrows fire in just a few seconds. The best part is how easy these are to build. You basically take the idea behind making a single machine gun and turn it into an automated home defense system. Your rapid pulsar is the heart of your machine gun, and you can use any variety you'd like. I prefer the standard design, but any of them will work just fine. I won't go into detail on how to build a rapid pulsar, but if you have any questions about what they are or how they work, check out this earlier post about them. There are a number of ways to break the circuit, but this is the one that I prefer. 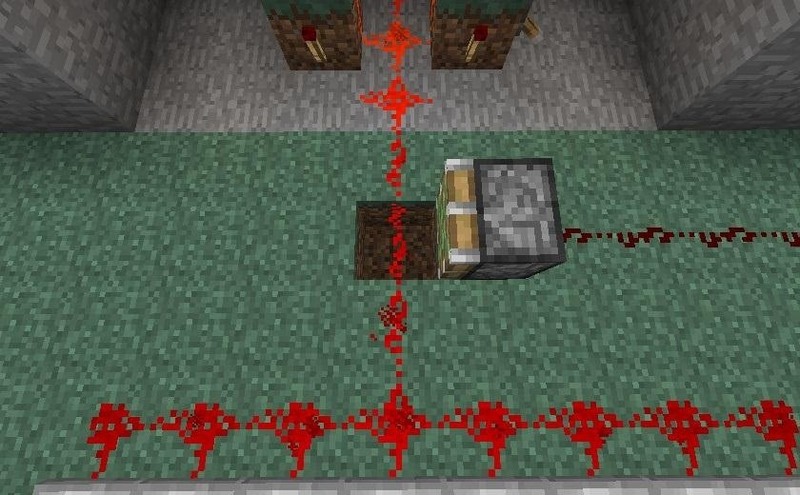 Essentially just make a hole in the ground, put redstone in it, and then cover it with a block. 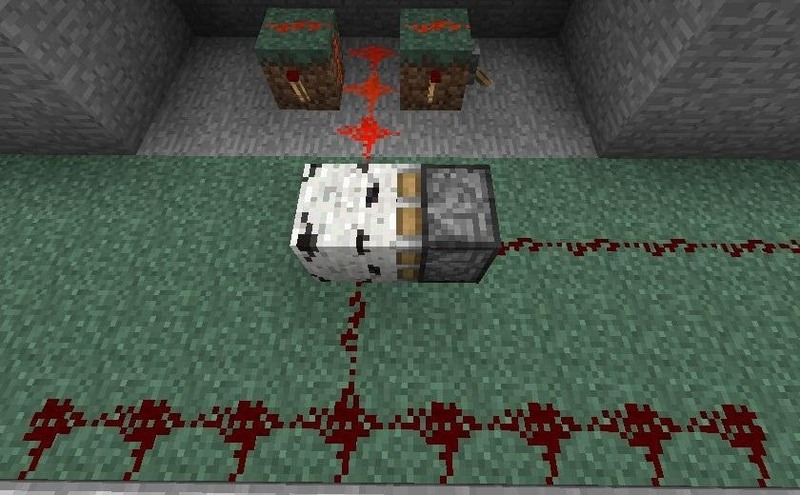 The block will prevent the redstone signal from transferring upward until you push it out of the way with a piston, allowing the circuit to complete. Here's the hole and piston, and you can see that the circuit is complete. And now there's the interruption! When the piston fires, the wood block will be moved out of the way, allowing the circuit to once again complete. Now you place your dispensers. 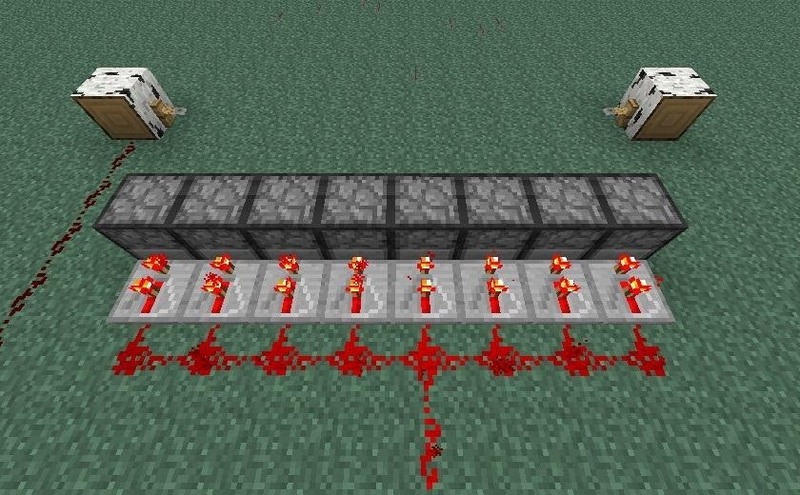 You can place as many of them as you like, but bear in mind that redstone power only travels 12 blocks, so without any repeaters you're looking at a maximum of 24 blocks of machine-gun goodness. How many you want to use will depend on how big the entryway to your house is, and how extravagant you are. In this case, I used 8. 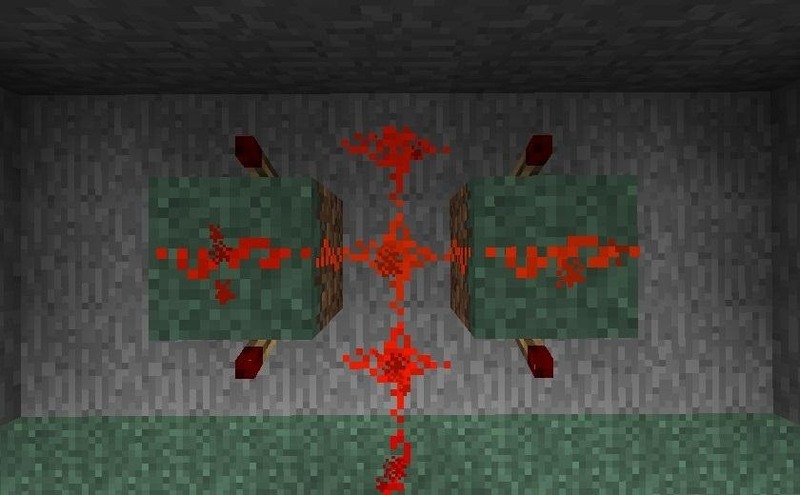 Place the dispensers so that they face your area of attack, and put a repeater facing each one from behind, to adjust for variations in server lag. I find that one extra tick of delay works best on my server, but your mileage may vary. With the advent of tripwires, this has become a much easier endeavor. Doing this with pressure plates was possible, but it was kind of a pain. With tripwires, though, all you need is one wire that runs across the ground in front of your machine gun array. 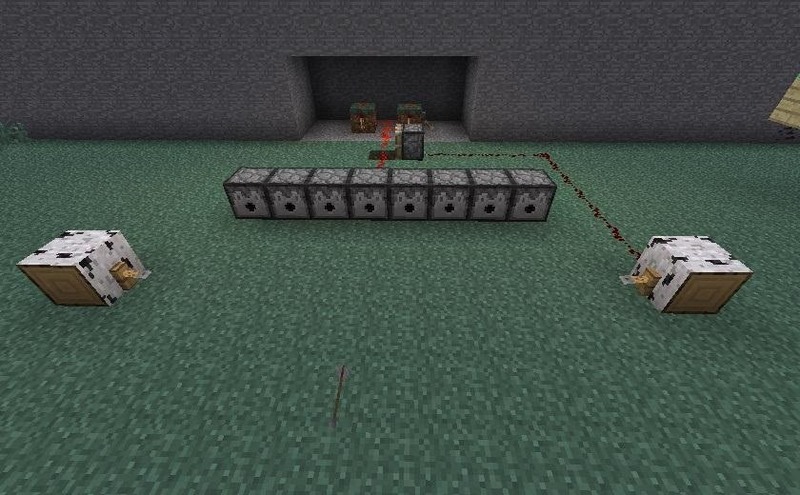 Connect one side of your tripwire to the piston in your circuit breaker, and you have a fully-functioning automatic machine gun home defense! Don't forget to arm it by filling your dispensers with arrows, and you're good to go! Build your home on top of one of these puppies and you don't have to worry about unwanted visitors! If you have a better design, don't hesitate to share it with us!